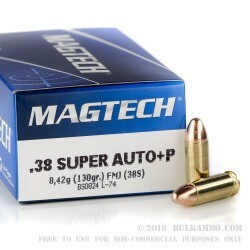 A very straightforward 38 Super target and practice round for the fun .38 Super Auto +P firearms. 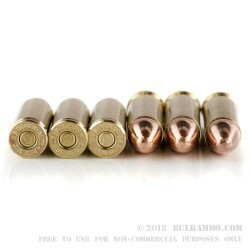 This is a MagTech load that features a 130 grain projectile in a conical profile with a full metal jacket that is comprised of copper plating. This is a dedicated target round that has great accuracy and very good reliability. 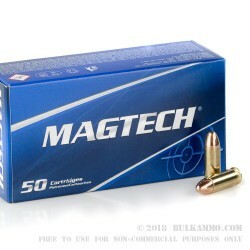 MagTech is a company founded in 1990 to serve as the civilian marketing arm for the CBC production conglomerate based in Sao Paulo brazil, which happens to be one of the largest production suppliers of ammunition in the world; having subsidiaries that include the Sellier & Bellot, MEN and the MagTech brand names as part of their portfolio. In recent years the .38 Super Auto +P has seen extensive use in pistol shooting competitions and in clones of the 1911 style of pistols. The primarily Latin American popularity has spilled into other regions of the world including Australia and the United States, where the caliber has seen a resurgence in popularity with self defense users due to the high velocities and decent projectile size as well as competition shooters who recognize the sporting characteristics of the round.